Word is that Ashton’s investing in yet another Berlin-based company. We can’t release all the juicy details yet, but in the meantime, we can give you strategic pointers on how you can be next. So what does it take to get this disruptive Twittoisseur to notice your platform? What new ideas will catch his attention this year? And how can you prepare for his next visit to Berlin? Here’s our comprehensive analysis of Ashton’s investing habits, tip by tip. It’s clear Ashton’s taken a particular liking to our bustling village, and who wouldn’t? Last year’s funding rounds for SoundCloud and Amen positioned the favored two companies in an international playing field and brought one of Kutcher’s favorite features to the forefront: p2p. In other words, be resourceful. Be resilient. And do it on little money. Ashton has commented that a team’s ability to “keep servers from crashing at the start” is a good indication of future success. So by all means, when he clicks on your site or knocks on your door, make sure it’s working. It’s important he sees you have a tenacious survival instinct to build up a strong foundation from the get-go. Kutcher is a firm believer in technology as a means of accelerating happiness. In a memorable interview with Michael Arrington at TechCrunch Disrupt in September, he put it this way: “The companies that will ultimately do well are the companies that chase happiness. If you find a way to help people find love, or health or friendship, the dollar will chase that.” When you get stuck developing p2p, return to the basic question: What makes an interaction positive as opposed to annoying, threatening, or dull? OK, this may land you on the ever-growing world’s worst resume list. But at least in terms of product logic, this could get you noticed. Kutcher has expressed interest in building a social recommendation platform that directs people to the products and experiences “diametrically opposite of what [they] like.” To use his anology, build “the exact opposite of your ex-girlfriend,” and you’ll probably date her. In other words, experiment. Consider what the current social objectives are and question them. Play with the best and the worst. After all, it was this very bipolarity that drew Kutcher to Amen. The products and platforms Ashton seeks out are aimed at becoming global market leaders. That means you need to think globally and understand cultural differences. So in building your product, for instance, understand not only IT culture in Germany (where the language limits the reach to a local range) but also how IT culture differs in the US. If you have a million users in Germany, it means something quite different than a million in the US, where the language enables and requires global reach. If you want to work with Ashton, take a global mindset from day 1. The next decade will be all about continent-bridging incubators. Kutcher has said he doesn’t care at all about market potential (“I’ve become immune to people talking about market cap”). Much more important is the strength of your team and your product, so bear this in mind long before you reach the pitching point. Ashton’s investments often lead to a nearly double-the-figure round in the not-too-distant future. Think outside the box in terms of measuring the potential of your company, and you will likely build a more innovative product. Many founders have a great product, but not all of them have the team to sustain and support it through all its life stages. Ashton looks for companies that are prepared for growth from the onset. Make sure you identify and team up with the right people early on. In the German style, an incubator generally builds a start-up at a low cost, waits for a bigger VC to invest, allows the company to attain size, and then exits to a partner company that receives extra funds from large foreign funds. To do it the Ashton way, you will benefit to get your team together from the onset, finding a group of IT professionals, investors and VCs who could propel the business from the start. Start looking! Your team means everything. Don’t use it “to share mundane things or for self-glorification.” Kutcher’s rule of thumb (as well as Tony Hsieh’s) is this: Share content that inspires, connects, entertains, or educates (the acronoym to remember it is ICEE). And listening is as important at posting. Kutcher suggests you act like the pipe, not the source. “It’s not about what you post but what you listen to,” Kutcher once said. No, really. Kutcher has projected that the next big wave in technology will be wearable technologies. High-fashion bracelets that track your health and sleep, rings that let you take pictures with your fingers… eye lens contacts that let you identify people in front of you? Consider it. Kutcher was the first Twitter user to reach 1 million followers. With 8.2 million this November, much to the dismay of his 8.2 million (currently 9,152,729) followers, Kutcher handed over his feed reigns to his production company, Katalyst Media. Before you ditch out too, try and build a filter that prevents @aplusk and the rest of us from getting Spammed. 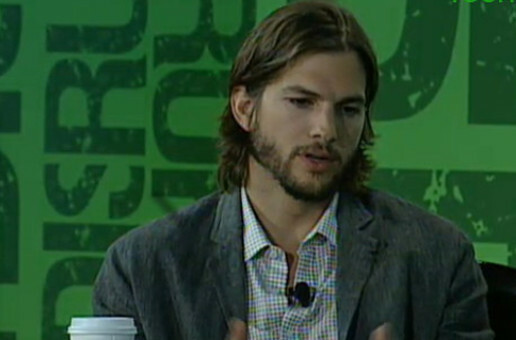 Kutcher has expressed worry that Twitter could become (don’t say it, don’t say it) Myspace-y. “I have people hit my @reply feed every day with garbage,” he says, “If Twitter doesn’t apply the proper filters, it’ll be harder to find the information you want.” Twitter has been integral to Kutcher’s success, so however you use it, use it. To watch Ashton whistle out of a window on his recent pre-holiday visit to Berlin, click here. For more on his company’s investment strategy, check it out A Grade Investments, (he founded A Grade with Maverick Records’ Guy Oseary and the supermarket billionaire Ron Burkle.) Hey, we told you we’d give you the best and the worst!